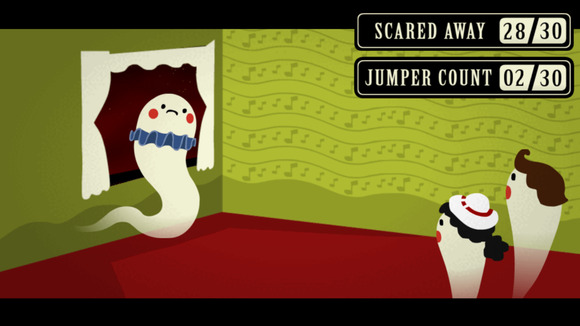 Possess objects and scare unsuspecting townspeople in this ghostly game. It’s Halloween, you’re a ghost, and all you want to do is rest in peace. But there are people nosing about your local haunting grounds—which include a spooky old mansion, a ghost town, and a carnival-themed runaway train. A different type of puzzle: In Haunt the House, you play a mischievous ghost trying to rid his mansion/town/department store/ghost train of pesky visitors. The goal: Scare away living bodies as quickly as possible, by possessing objects and performing various creepy functions. Haunt the House does feature achievements and goals (your haunting skills are timed, and at the end of each level you’re presented with a letter grade that indicates how effective you were at scaring the pants off people), but this game is really more about the journey than the destination. While each level does have an exit, you don’t necessarily need to scare people toward that exit. Instead, the “puzzle” part of this game focuses on raising the terror-level in the house (or department store, or train, etc) by haunting objects near people. To haunt an object, you can either double-tap it, or move your ghost over it and press “Possess ______” in the lower right corner. To perform a scary function—lights, for example, can flicker—just tap the object once you’re inside it. To leave the object, double-tap outside it. As you raise the terror-level (from “Relaxed” to “Quiet” to “Unsettling” to “Terrifying”), scarier functions open up on objects—that light that used to flicker can now bust a bulb. To scare people out of your house completely, follow them around and possess objects near them until they can’t take it anymore. It’s all in the details: Haunt the House may not have console-worthy survival horror graphics, but it’s one of the most detailed games I’ve ever played. Almost every single object in each scene can be possessed—including individual cups and pitchers sitting on a table (as well as the table itself!). 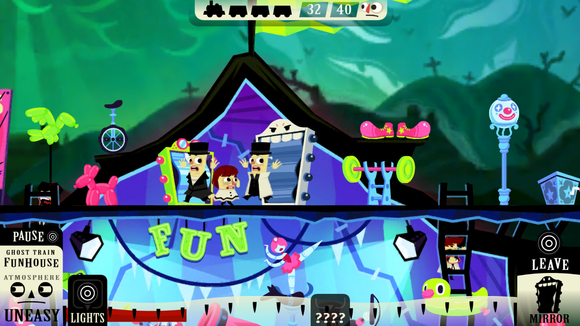 Each possessed object has a couple of different functions, complete with unique animations and sound effects. The goal of this game is to scare people away as fast as possible, but you’ll probably find yourself ignoring the time factor as you jump into each and every object to find out what happens when you poke them. Halloween-themed, but not at all scary: This is perhaps not surprising, but most Halloween-themed games are scary—or at least, they try to be. And the games that aren’t scary are designed for small children. 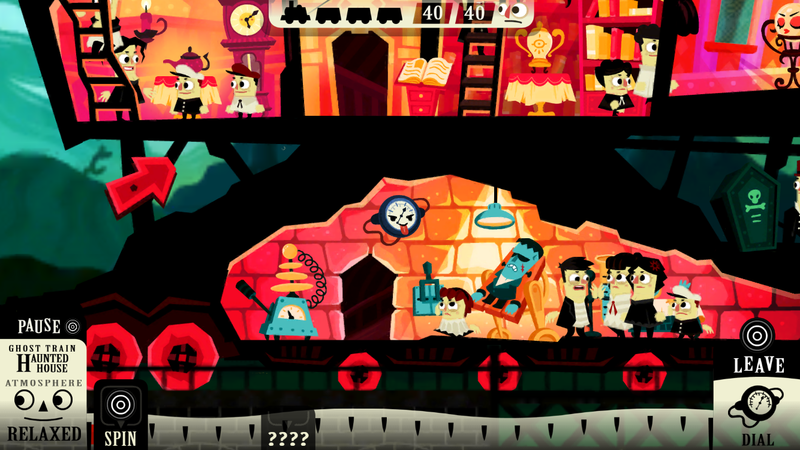 But Haunt the House delivers a nice dose of the Halloween spirit without causing nightmares. The ghosts are adorable to begin with, and each object they possess takes on their color scheme and face. How terrifying can a boiler-room thermometer be when it has a cute little ghost face? 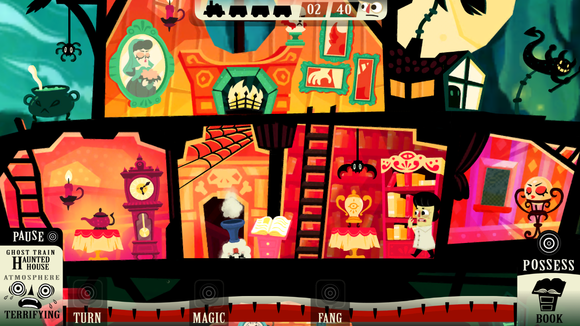 Luckily, the residents of Terrortown don’t share my opinion on the ghost’s adorableness, or this game would be much more difficult to finish.